This page provides you with Project Manager resume samples that you can use for inspiration in writing your own resume, or for creating one through our easy-to-use resume builder. Below you'll find our how-to section that will guide you through each section of a Project manager resume. Project Management is one of the most competitive job markets right now: if you’re worried about the high number of competitors in this space, please don’t - we are here to help you and to get you where you want to be. We have been recognised to have the best Project Manager Resume sample, so let us inspire you! Relax and make sure you focus for the next 15 minutes, we are about to give you the standout resume you need to make the difference! Any employer looking to recruit a competent project manager will take a close look at your resume, and you know it could even take them less than one minute to choose if yours is worthy or not.Having a resume highlight the key aspects of your know-how and talents can open the eyes of any recruiter and make them say “I want this person in front of me right now!” Our resume samples have become some of the best available today, proved by the fact that over three million people so far have put their trust in us. 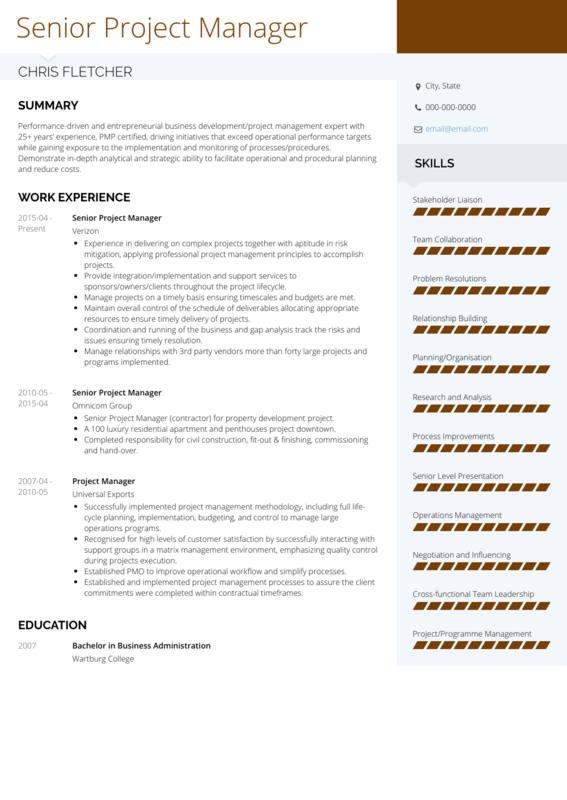 Create a simple yet effective resume for your Project Management career right now! We mentioned it before, this is a crazy space, despite your successful experience as a project manager. You have the experience, the skills, the education and even the referrals, although, if you are not able to translate this into a fantastic resume, the recruiter will most likely perform a Kobe Bryant shot and bin it! Let us help you, starting from the fact that it is vital to use a down-to-earth but professional overtone. Essentially you want to avoid technical sounding words as employers don’t want technical jargon thrown at them. You have to ensure you have a simple-to-read layout of the resume. Ideally, your skills or talents, along with your degrees will be highlighted above everything else. We strongly suggest the reverse-chronological resume format, to showcase who you are: your skills, your expertise, your experience and your strengths. And don’t forget: it’s the little details which count, so make sure you avoid simple errors with structure and grammar. They’re definitely disliked by recruiters, Oh, PDF is the way to go: you don’t want Microsoft Word and its weird formatting to be the reason of your rejection. Include any and all skills you have that relate to the position being filled. Always tell employers about responsibilities you had at previous jobs which relate to the current position. Be as specific as possible: anyone can be a project manager, not many can be as good as you!. Make sure you give the employer a reason to hire you! Try not to be too coy about your previous history in project management. Don’t pretend you have skills when you have none. Fluff your resume with irrelevant information. If you’re lucky enough to have an employer make it this far you’re doing great! However, what about the old adage work history and experience? OK, you can’t fake that but it’s not impossible to improve it. If you lack work history you need to find ways to change that including part-time and seasonal roles. What is more, adding achievements which you’ve reached can allow your resume to appeal to recruiters. You aren’t trying to inflate your ego but rather showcase why you are the one for the job. Add roles which relate to project management. Include internships as a project manager should be included. Cram dozens of references into the resume. Miss out references or work history. Lie. No matter what, don’t lie! Need more tips on writing an efficient work experience section for a Project Manager? Check out our detailed resume guide! Education means a lot to every employer as they want to be assured the person they hire is competent. It’s important to include every piece of education you’ve received, especially what relates to project management. The college you attended and where it can be found. How many years you studied for project management. What, if any, degrees do you hold including but not limited to project management. These are three basic elements of any resume. Adding work experience can help and there are many ways to help improve upon a lack of experience. Showing you have a knowledge of project management may entice the recruiter to look at you again. Recruiters have newer methods of making a candidate stand out and you have to ensure you put your all into the resume. For starters, skills which relate back to the job will be crucial. You can add your soft skills and hard skills also. Soft and hard skills are essentially the skills you have within and skills which relate to project management. We can help you when it comes to understanding these further. We believe putting in your soft and hard skills can appeal to employers far more. Cover Letter: yes or no? Cover letters which match the level of professionalism of your resume can often offer an advantage over other potential candidates. Follow our tips here. We want to help you land your dream role and there are a few more tips which can help. Add a link to online portfolios you might have. Keep the resume two pages or less. Always include any roles similar to the one you’re applying for now. Use an email address which is offensive or unprofessional sounding. Use more than one font type. Spill secrets from past employment roles.